This article shows how to build a hybrid cloud application with Microsoft Azure and Visual Studio. You create an application that uses multiple Azure resources up and running in the cloud. How to create or adapt an existing web service for consumption by a web solution. 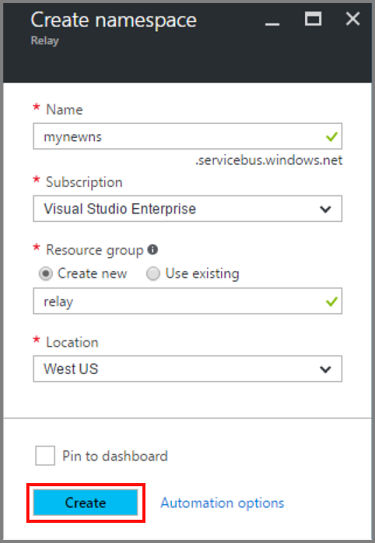 How to use the Azure WCF Relay service to share data between an Azure application and a web service hosted elsewhere. 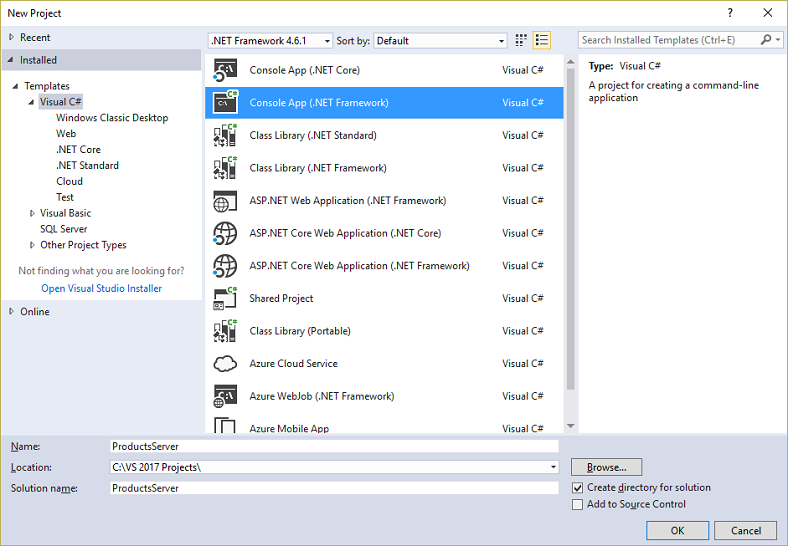 Azure SDK for .NET. Install it from the SDK downloads page. Business solutions are typically composed of a combination of custom code written to tackle new and unique business requirements and existing functionality provided by solutions and systems that are already in place. Solution architects are starting to use the cloud for easier handling of scale requirements and lower operational costs. In doing so, they find that existing service assets they'd like to leverage as building blocks for their solutions are inside the corporate firewall and out of easy reach for access by the cloud solution. Many internal services are not built or hosted in a way that they can be easily exposed at the corporate network edge. Azure Relay is designed for the use-case of taking existing Windows Communication Foundation (WCF) web services and making those services securely accessible to solutions that reside outside the corporate perimeter without requiring intrusive changes to the corporate network infrastructure. Such relay services are still hosted inside their existing environment, but they delegate listening for incoming sessions and requests to the cloud-hosted relay service. 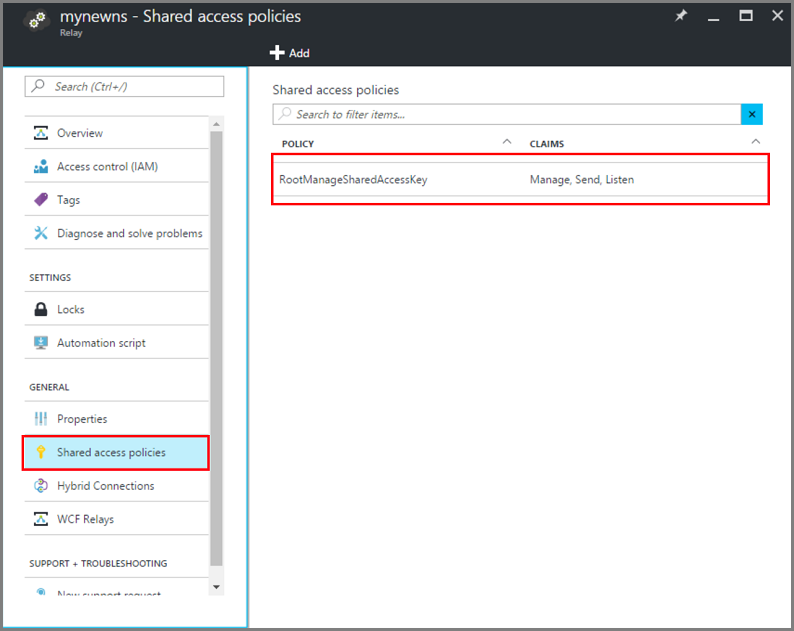 Azure Relay also protects those services from unauthorized access by using Shared Access Signature (SAS) authentication. 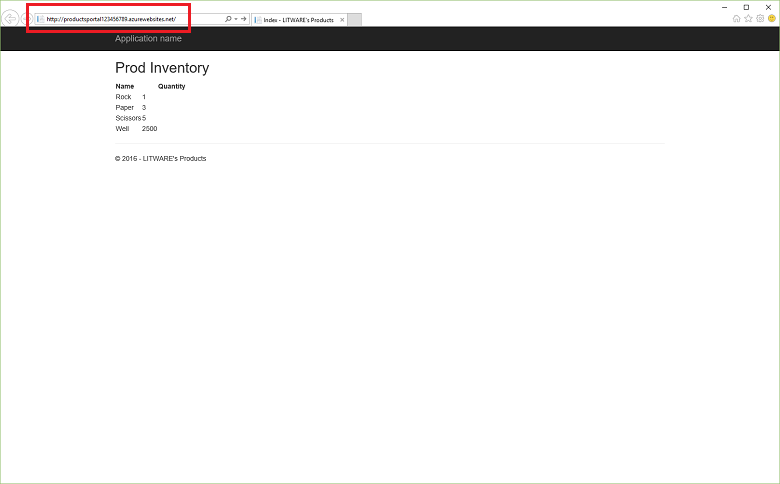 In this tutorial, you create an ASP.NET website that enables you to see a list of products on the product inventory page. The tutorial assumes that you have product information in an existing on-premises system, and uses Azure Relay to reach into that system. This is simulated by a web service that runs in a simple console application and is backed by an in-memory set of products. You will be able to run this console application on your own computer and deploy the web role into Azure. By doing so, you will see how the web role running in the Azure datacenter will indeed call into your computer, even though your computer will almost certainly reside behind at least one firewall and a network address translation (NAT) layer. 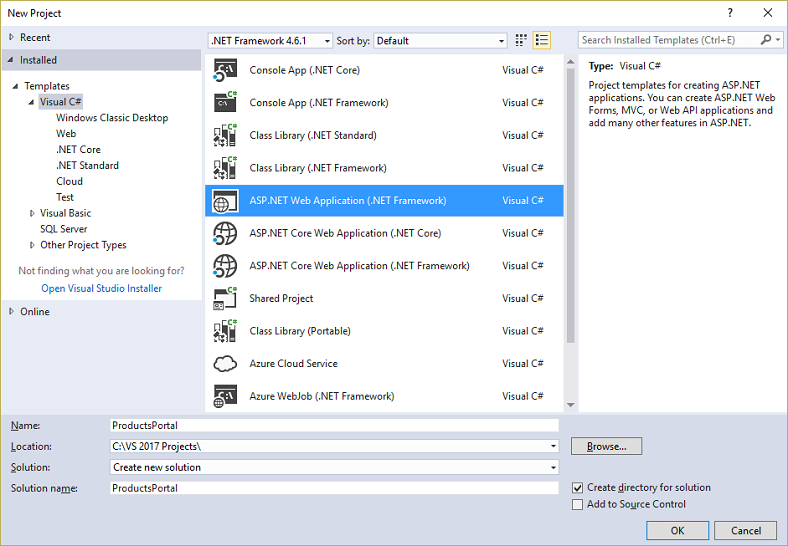 Install the Azure SDK for .NET from the SDK downloads page. In the .NET column, click the version of Visual Studio you are using. The steps in this tutorial use Visual Studio 2017. When prompted to run or save the installer, click Run. In the Web Platform Installer, click Install and proceed with the installation. Once the installation is complete, you will have everything necessary to start to develop the app. The SDK includes tools that let you easily develop Azure applications in Visual Studio. 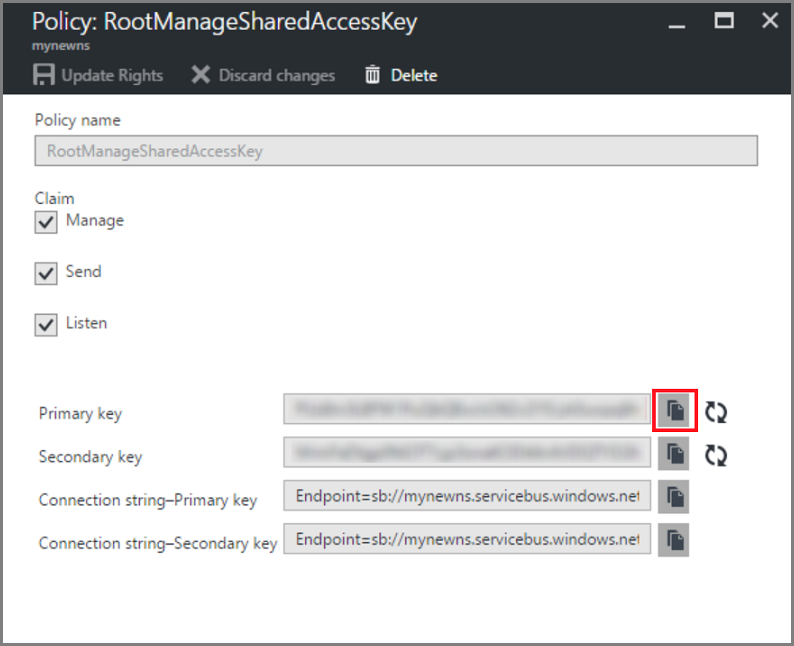 The first step is to create a namespace, and to obtain a Shared Access Signature (SAS) key. A namespace provides an application boundary for each application exposed through the relay service. A SAS key is automatically generated by the system when a service namespace is created. The combination of service namespace and SAS key provides the credentials for Azure to authenticate access to an application. First, you build a simulated on-premises product catalog system. 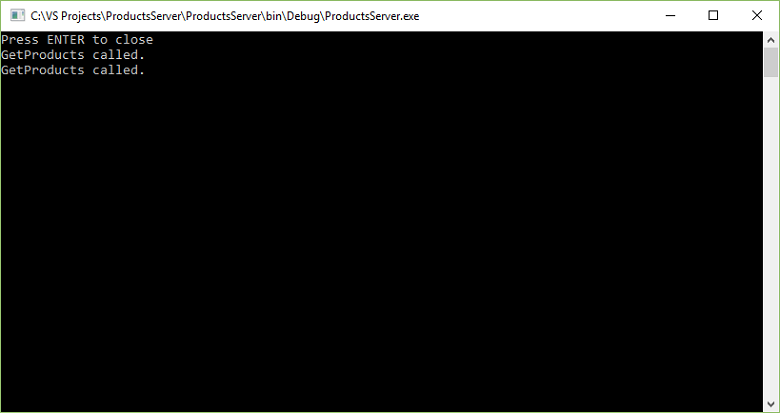 This project is a Visual Studio console application, and uses the Azure Service Bus NuGet package to include the Service Bus libraries and configuration settings. Using administrator privileges, start Microsoft Visual Studio. To do so, right-click the Visual Studio program icon, and then click Run as administrator. In Visual Studio, on the File menu, click New, and then click Project. Click OK to create the ProductsServer project. If you have already installed the NuGet package manager for Visual Studio, skip to the next step. Otherwise, visit NuGet and click Install NuGet. 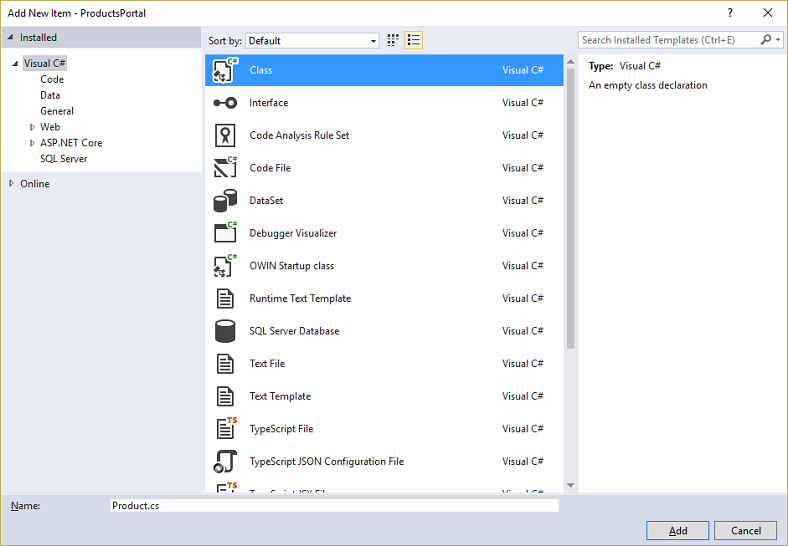 Follow the prompts to install the NuGet package manager, then restart Visual Studio. In Solution Explorer, right-click the ProductsServer project, then click Manage NuGet Packages. Click the Browse tab, then search for WindowsAzure.ServiceBus. Select the WindowsAzure.ServiceBus package. The required client assemblies are now referenced. Add a new class for your product contract. In Solution Explorer, right-click the ProductsServer project and click Add, and then click Class. In the Name box, type the name ProductsContract.cs. Then click Add. In ProductsContract.cs, replace the namespace definition with the following code, which defines the contract for the service. In Program.cs, replace the namespace definition with the following code, which adds the profile service and the host for it. // Implement the IProducts interface. // when the list of products is retrieved. // Define the Main() function in the service application. The error caused by "transportClientEndpointBehavior" is just a warning and is not a blocking issue for this sample. Still in App.config, in the <appSettings> element, replace the connection string value with the connection string you previously obtained from the portal. Press Ctrl+Shift+B or from the Build menu, click Build Solution to build the application and verify the accuracy of your work so far. In this section, you build a simple ASP.NET application that displays data retrieved from your product service. Ensure that Visual Studio is running with administrator privileges. From Installed Templates, under Visual C#, click ASP.NET Web Application (.NET Framework). Name the project ProductsPortal. Then click OK.
From the ASP.NET Templates list in the New ASP.NET Web Application dialog, click MVC. Click the Change Authentication button. In the Change Authentication dialog box, ensure that No Authentication is selected, and then click OK. For this tutorial, you're deploying an app that does not need a user login. 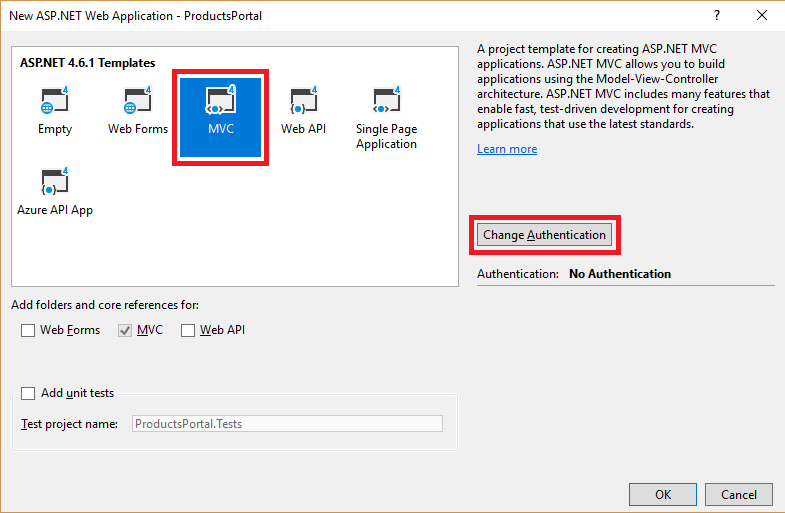 Back in the New ASP.NET Web Application dialog, click OK to create the MVC app. Now you must configure Azure resources for a new web app. Follow the steps in the Publish to Azure section of this article. Then, return to this tutorial and proceed to the next step. In Solution Explorer, right-click Models and then click Add, then click Class. In the Name box, type the name Product.cs. Then click Add. // Declare properties for the products inventory. In Solution Explorer, expand the Controllers folder, then double-click the HomeController.cs file to open it in Visual Studio. // Return a view of the products inventory. In Solution Explorer, expand the Views\Shared folder, then double-click _Layout.cshtml to open it in the Visual Studio editor. Change all occurrences of My ASP.NET Application to Northwind Traders Products. Remove the Home, About, and Contact links. In the following example, delete the highlighted code. To verify the accuracy of your work so far, you can press Ctrl+Shift+B to build the project. Ensure that ProductsPortal is the active project. 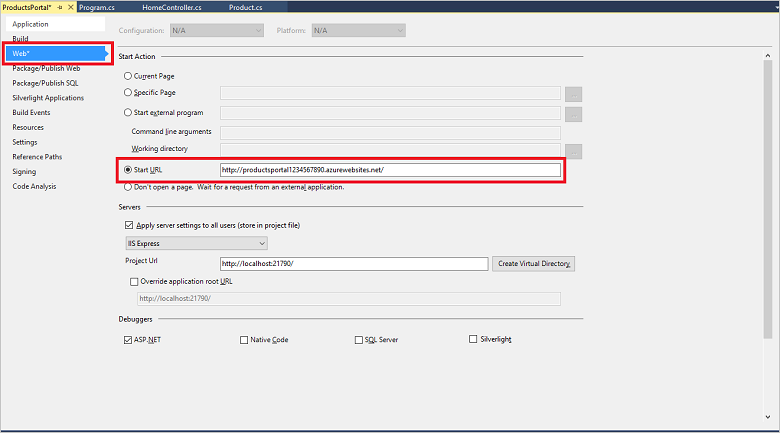 Right-click the project name in Solution Explorer and select Set As Startup Project. In Visual Studio, press F5. Your application should appear, running in a browser. 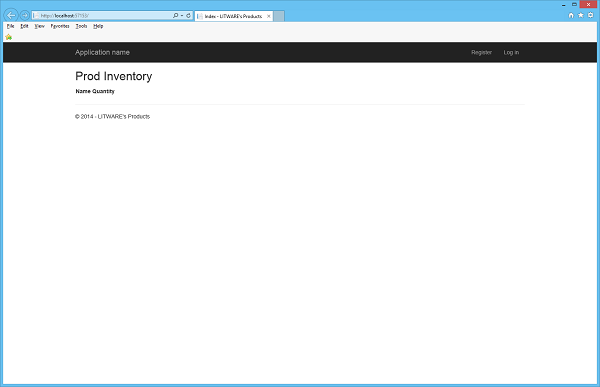 The next step is to hook up the on-premises products server with the ASP.NET application. 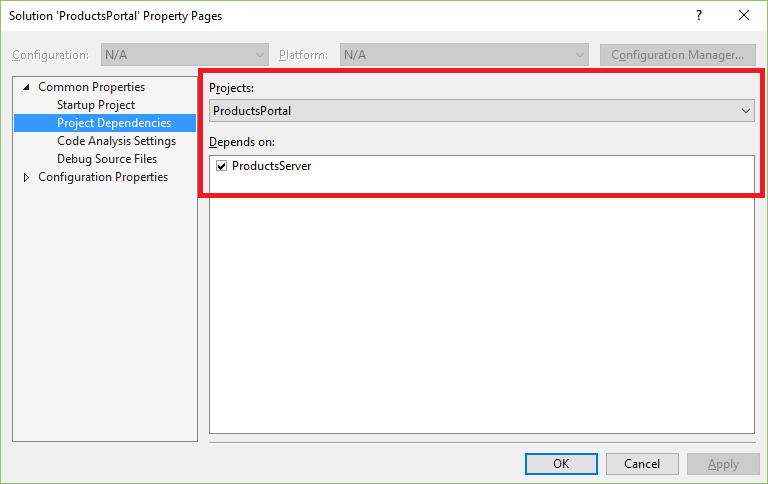 If it is not already open, in Visual Studio reopen the ProductsPortal project you created in the Create an ASP.NET application section. Similar to the step in the "Create an On-Premises Server" section, add the NuGet package to the project references. In Solution Explorer, right-click the ProductsPortal project, then click Manage NuGet Packages. Search for WindowsAzure.ServiceBus and select the WindowsAzure.ServiceBus item. Then complete the installation and close this dialog box. In Solution Explorer, right-click the ProductsPortal project, then click Add, then Existing Item. Navigate to the ProductsContract.cs file from the ProductsServer console project. Click to highlight ProductsContract.cs. Click the down arrow next to Add, then click Add as Link. Now open the HomeController.cs file in the Visual Studio editor and replace the namespace definition with the following code: Be sure to replace yourServiceNamespace with the name of your service namespace, and yourKey with your SAS key. This enables the client to call the on-premises service, returning the result of the call. // Declare the channel factory. In Solution Explorer, right-click the ProductsPortal solution (make sure to right-click the solution, not the project). Click Add, then click Existing Project. 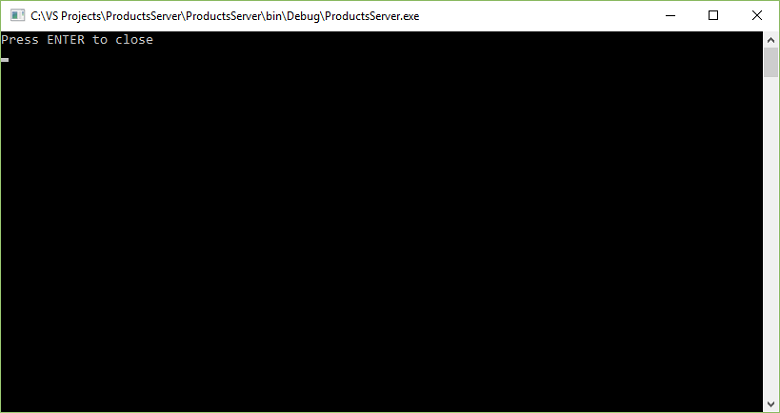 Navigate to the ProductsServer project, then double-click the ProductsServer.csproj solution file to add it. ProductsServer must be running in order to display the data on ProductsPortal. In Solution Explorer, right-click the ProductsPortal solution and click Properties. The Property Pages dialog box is displayed. On the left side, click Startup Project. On the right side, click Multiple startup projects. Ensure that ProductsServer and ProductsPortal appear, in that order, with Start set as the action for both. Still in the Properties dialog box, click Project Dependencies on the left side. In the Projects list, click ProductsServer. Ensure that ProductsPortal is not selected. In the Projects list, click ProductsPortal. Ensure that ProductsServer is selected. Click OK in the Property Pages dialog box. To test the application locally, in Visual Studio press F5. The on-premises server (ProductsServer) should start first, then the ProductsPortal application should start in a browser window. This time, you see that the product inventory lists data retrieved from the product service on-premises system. Press Refresh on the ProductsPortal page. Each time you refresh the page, you see the server app display a message when GetProducts() from ProductsServer is called. Close both applications before proceeding to the next step. 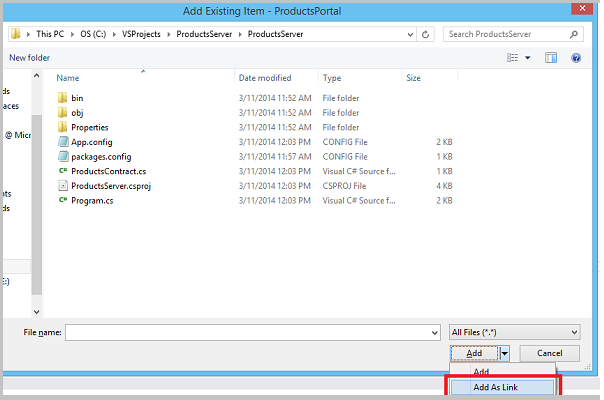 In Solution Explorer, right-click the ProductsPortal project, and click Publish. Then, click Publish on the Publish page. You may see an error message in the browser window when the ProductsPortal web project is automatically launched after the deployment. This is expected, and occurs because the ProductsServer application isn't running yet. Close the browser window to stop the running application. Before running the application in the cloud, you must ensure that ProductsPortal is launched from within Visual Studio as a web app. 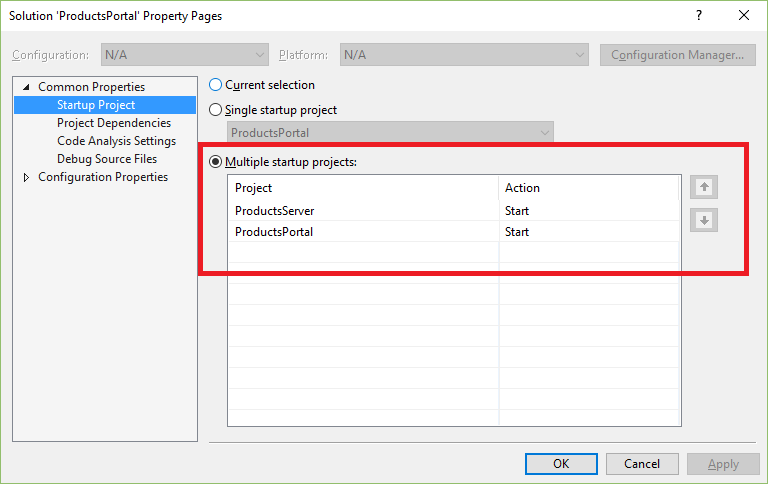 In Visual Studio, right-click the ProductsPortal project and then click Properties. In the left-hand column, click Web. In the Start Action section, click the Start URL button, and in the text box enter the URL for your previously deployed web app; for example, http://productsportal1234567890.azurewebsites.net/. From the File menu in Visual Studio, click Save All. From the Build menu in Visual Studio, click Rebuild Solution. Press F5 to build and run the application. The on-premises server (the ProductsServer console application) should start first, then the ProductsPortal application should start in a browser window, as shown in the following screenshot: Notice again that the product inventory lists data retrieved from the product service on-premises system, and displays that data in the web app. 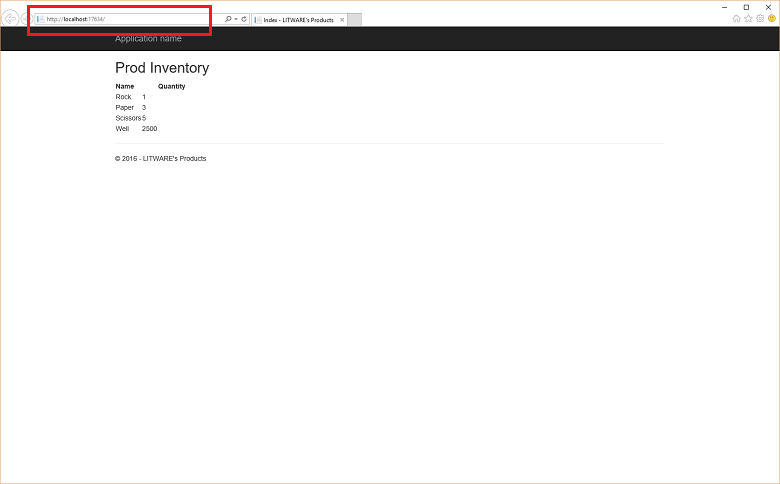 Check the URL to make sure that ProductsPortal is running in the cloud, as an Azure web app. The ProductsServer console application must be running and able to serve the data to the ProductsPortal application. If the browser displays an error, wait a few more seconds for ProductsServer to load and display the following message. Then press Refresh in the browser. Back in the browser, press Refresh on the ProductsPortal page. Each time you refresh the page, you see the server app display a message when GetProducts() from ProductsServer is called.